Markets are looking becalmed early Tuesday but a series of company earnings could liven things up. U.S. stock futures were slightly lower following Monday's comeback rally. "The economic data will be the key market driver of the day," said Peter Cardillo, chief market economist at Rockwell Global Capital, referring to upcoming reports on factory orders and the Institute for Supply Management. "Earnings are taking a back seat now as the earnings season is winding down." 1. Earnings on tap: Companies including Cablevision (CVC) and MGM Resorts (MGM) are set to release quarterly results before the opening bell. Coach (COH) shares jumped 5% in premarket trading. The fashion designer managed to beat estimates despite significant year-to-year slumps in quarterly profit and sales. CVS Caremark (CVS) shares rose 2% after the pharmacy chain reported double-digit percentage increases in revenue and profit. Office Depot (ODP) shares also rose 2% after the retailer reported strong growth in revenue and profit. Then after the close, Wall Street will get to see earnings from Groupon (GRPN), Activision (ATVI), Take-Two (TTWO), Walt Disney (DIS) and Zillow (Z). 2. Economic data: The U.S. Census Bureau will issue its monthly report on factory orders at 10 a.m. ET. At the same time, the Institute for Supply Management will release data on the performance of the U.S. services sector for July. 3. International markets overview: European markets were rising in early trading, with sentiment boosted by data showing the eurozone's manufacturing and services sectors continued improving for the 13th month running in July. The CAC 40 index in Paris was the best performer in Europe, rising by 0.7%. Performance on Asian markets was less inspiring. 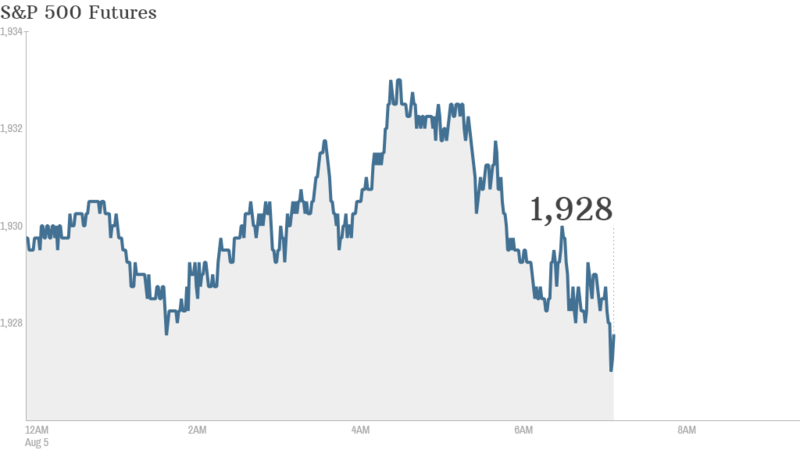 Most major markets fell Tuesday, with the Nikkei in Japan dipping by 1%.